Davey is a man of few words, but one thing that we’ve all learned over his 40-year career at GSM Roofing is that his words always have value. Whether it’s mentoring a less experienced roofer, communicating to customers about a project, or sharing a fun story with his co-workers, his few words always pack a punch. “ ‘Is it always like this?’ That was the question that Dave asked after his first time acting as Service Superintendent. Remnants of a hurricane were passing through Pennsylvania and GSM Roofing was being overwhelmed with phone calls and emergencies. The activity was extremely high, the customer demands overwhelmed our ability to respond and everyone was exhausted by the end of the day. Our response to his question was ‘No, but welcome to the Service Department’. Thankfully those days are rare and most days we have an opportunity to organize ourselves and our customer response. Looking back on his roofing career he fondly remembers his first project as a foreman, a Tremco Thermastic Built Up roof. He is quite proud that this roof was installed in the 80’s and is still in good condition. And, as we all remember where we were on 9/11/01, Davey was on a roof in northern NJ. 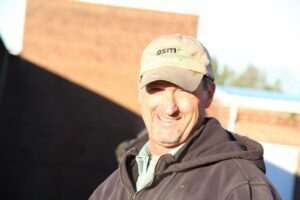 He could see the smoke rising in the distance but was unaware of what happened until maintenance personnel at the jobsite invited Davey and his crew inside to watch the events on TV. Davey grew up in the Denver area with eight siblings and dreamed of being an astronaut when he grew up. Although he hasn’t made it to space, he does get off the ground as a roofer! When he looks back he would like to tell his younger self to work smarter, not harder, save money, cultivate relationships, and spend as much time as possible with family. Outside of work Davey enjoys spending time with his wife, children, grandchildren, and dogs. Davey and his wife enjoy collecting, buying, selling, and trading antique house hardware. They enjoy visiting different antique shops/shows and flea markets when they travel and sometimes plan vacations around this. He also enjoys hunting, but more for getting out in the woods and hunting an animal, not actually shooting anything. During retirement, Davey looks forward to sitting on the patio each morning with a cup of coffee in his hand and just peacefully watch the world go by. He’s excited to experience life on his schedule, spend more time enjoying his hobbies, and visiting his cabin with his wife. Davey will be missed at GSM Roofing, for his extensive roofing knowledge and his quiet, calm, friendly demeanor that is hard to replace. While Davey leaves some pretty big shoes to fill his replacement, Mel Auker, is ready to step into them. Mel has worked for GSM Roofing for 35 years. He previously worked as a truck driver, but was looking for a career with better hours. His father worked for GSM and encouraged Mel to apply. In fact, GSM became a family affair when Mel’s brother joined the team too. Mel learned the trade of roofing at GSM and quickly worked his way through the ranks, rising to service foreman. In this position, he led projects and mentored new roofers. He decided to apply for the Service Superintendent position because he was ready for a new challenge. Mel is married with 3 children and 7 grandchildren. He enjoys playing golf in his spare time. If he could have a superpower, he’d want the ability to cure others of whatever is ailing them. After speaking with Mel for awhile he turned to walk away but stopped and said, “Don’t you want to know my favorite sports team? It’s the Dallas Cowboys.” It seemed important to include – go ‘boys!